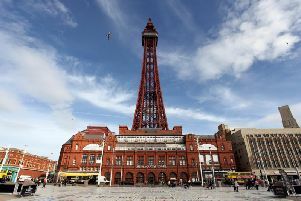 Blackpool Tower is set to launch into space thanks to a new Star Trek 3D projection show for Light Pool and the Illuminations. The short film, produced with CBS and Netflix, is being projected on to the front of The Blackpool Tower building each night as part of the LightPool shows throughout the Illuminations until Sunday, November 5. It has been created to coincide with the worldwide launch of Star Trek: Discovery, a new TV series and comes after the Star Trek franchise teamed up with dance group, Diversity, to switch on the Illuminations. Star Trek captain Gabriel Lorca (actor Jason Isaacs), was beamed on to a giant screen on the Tower Festival Headland to trigger an explosion of lights, fireworks and confetti, and kick-start 66 nights of Illuminations. The Star Trek projection complements two other space-themed shows in the free-to-watch LightPool. Down The Rabbit Hole portrays an astronaut exploring new worlds and Chasing Stars, featuring a voice over by Captain Tim Peake, presents an intergalactic tour.